Grace Paley, ‘Notes’, courtesy Bill Manhire, short fiction workshop, Victoria University, Wellington, 1997. 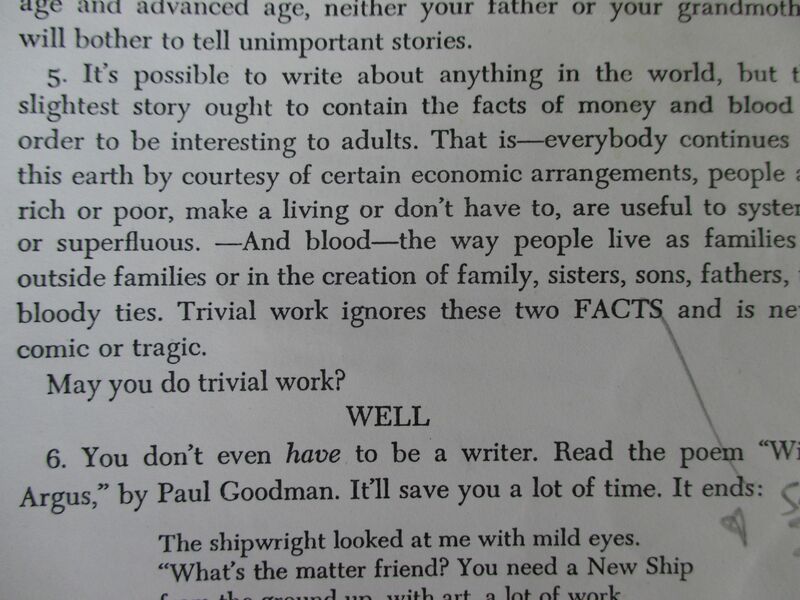 American writer Grace Paley says that trivial work ignores the two facts that make a story “interesting to adults”. Paley’s facts are money and blood, in that order. “That is – everybody continues on this earth by courtesy of economic arrangements, people are rich or poor, make a living or don’t have to, are useful to systems, or superfluous,” she says in ‘Some Notes on Teaching: Probably Spoken’. New Zealand poet Bill Manhire used to hand out Paley’s notes in his short fiction workshop at Victoria University, Wellington. I did the course in 1997. My economic arrangements then were quite simple: I worked three shifts a week as a subeditor at The Evening Post and I spent the rest of the time writing. I lived with my parents and paid them board. My short stories were published in Australia and New Zealand. The biggest fee was $90. Once again, it was subediting that allowed me to exist. I worked a few shifts a week at The Age. A book is a much bigger task than a short story. I’ve written three. Two have been published and one exists as a manuscript; something embryonic and under consideration. In 1997, when I did Bill’s course, there was only me to worry about but now I have three kids to support. I’m not alone, like many women, but my partner is a self-employed tradesman. He is very skilful and creative and could certainly earn enough to support the lot of us if he worked six long days a week but then I would be a furious cot case so what’s the point? Unfortunately, we are not independently wealthy either. So, what are the economic arrangements that made these books possible? If you are a writer or if you want to be one, this is the question but hardly anyone ever talks about money. Well, I’m not shy about it. Mostly writers are asked about the creative process, research, routines and office space. While it is always pleasing to learn about décor, writing timetables and whether a writer prefers to swim, jog or walk to blast away the gloom, I am more interested in how we survive when most writing work is unpaid and few books make any money. The Parihaka Album: Lest We Forget (Huia, 2009). ‘The Album’ took eight and a half years to write and I received at least $100,000 in public funding to do it. From 2001-2005, I had an Australian Postgraduate Award doctoral scholarship, an annual tax-free stipend of about $27,000. I also did regular freelance journalism, mainly for The Age. I turned my PhD into a book while I was a tenured academic at La Trobe University so this phase of the work was funded by the research fraction of my salary. The university gave Huia a $5000 publication subsidy and that paid for indexing, photographs and Anne Else’s really excellent structural editing. I think I got an $NZ500 advance and I have received maybe $NZ150 in royalties since then. The 80,000-word book has covered its costs. Huia has printed 1300 copies (in three small runs) and there are only 23 left. I feel good about that. 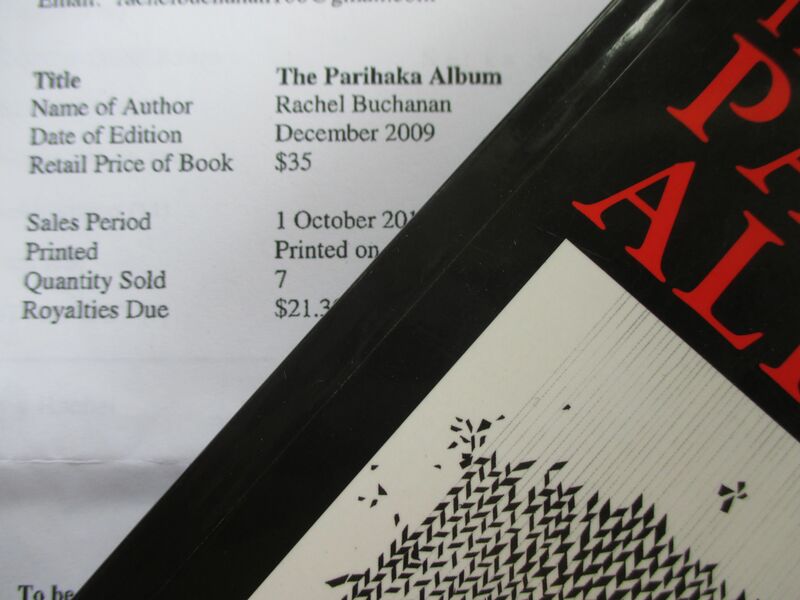 Portion of sales statement for The Parihaka Album, Huia Publishers, 30 April 2014. I was paid $21.30 in royalties. 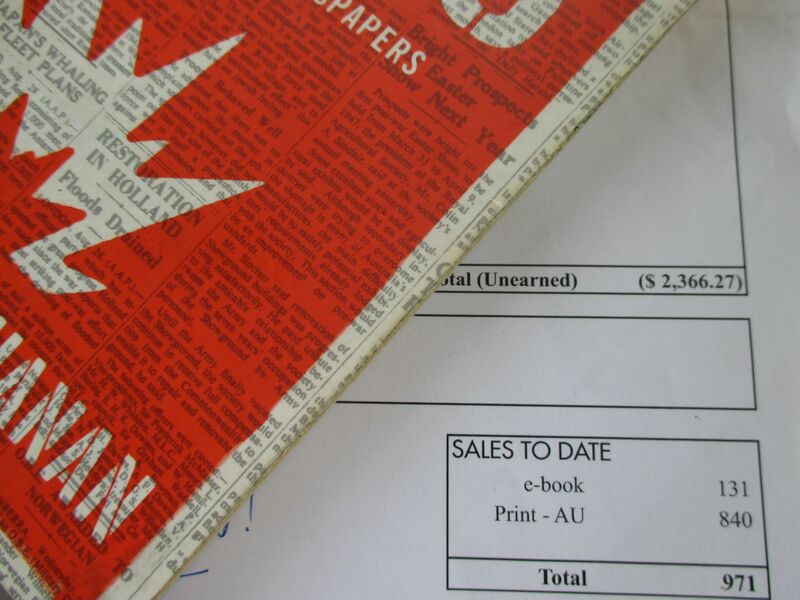 Stop Press: The Last Days of Newspapers (Scribe, 2013). This book (44,000 words) took seven months to write and was funded by a $A2000 advance from Scribe and an $NZ3000 Creative New Zealand quick response grant. More than half the advance went on getting to the Norske Skog print plant in Kawerau and up to Sydney for interviews. I worked on the book from October 2013 until April 2014. For the first two months, I also worked part time as an offshored subeditor working in Fairfax’s Wellington hub. Once we got back to Melbourne, I worked full time on Stop Press, often seven days a week. The Creative NZ grant funded the editing and rewriting phase, which was great. By the time the book was done, we were really broke. In August, I got a part-time job as an administrator at RMIT. I was so grateful to have stable, paid work with terrific colleagues. When Stop Press came out in September, I got another $2000 from Scribe. I used a quarter of this to pay for food and booze at the launch. Scribe printed 1500 copies of Stop Press. My latest royalty statement covers the six months to December 2014. It tells me that 840 print copies have been sold and 131 e-books. This means at least 500 copies are sitting in a warehouse somewhere. It’s not great but it’s reality. I’m proud of the book even though I have $2366.27 in “unearned royalties” and it has lost money all round. Sorry, Scribe. Portion of Royalty Statement, Scribe Publishers, from July-Dec 2014. The Unborn (manuscript, 60,000 words). I really hit the jackpot with this one! In late 2013, I was most surprised to get a $A40,000 emerging writers grant from the Australia Council for the Arts. I considered quitting my job but got real after a publicist reminded me: “It’s basically a minimum wage for a year.” I have just finished the manuscript. It took me two years. The money ran out long before the writing was done. About $14,000 of it went on tax anyway because of the day job. I did keep the ATM receipt with the $40,000 balance on it but it’s all greasy and faded now so I can’t reproduce here. So, now you know about my economic arrangements. There is a lot I could say about the other arrangements as well, such as the benefits of research supervision as a form of mentoring and editing, the benefits of being signed with a publisher before you start on a book, the benefits of a tight deadline, but perhaps I’ll leave that for another time. You might be interested to know that I have taken up weightlifting. I prefer it to swimming or jogging. In sum, I feel pretty sanguine about all of the above. I’m grateful to have been funded at all. I know how competitive the whole thing is. Obviously this post – like every other one on the blog – is unpaid writing work but the ‘economic arrangements’ behind books is an important topic that is rarely discussed so I was happy to write about it here. Plus, I wanted to get this stuff off my chest before I start a new job next week! 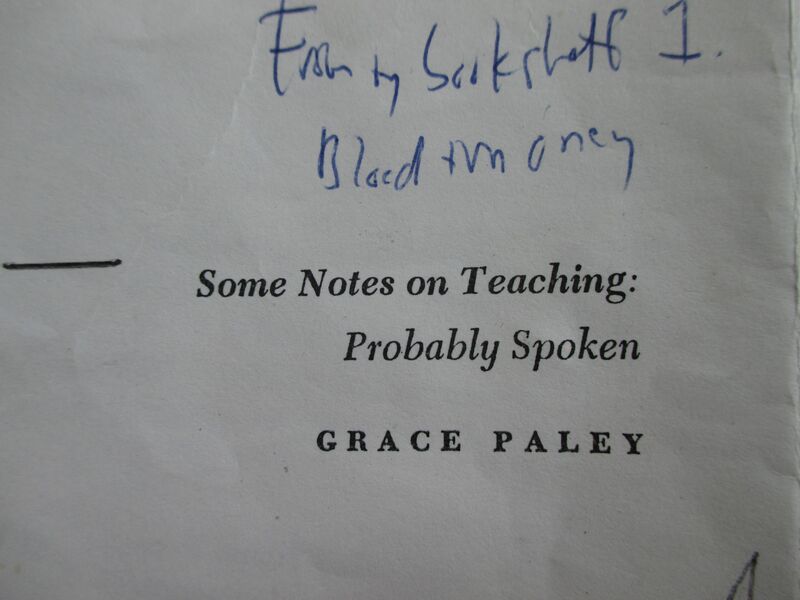 Point 5, ‘money and blood’ from Grace Paley, ‘Some Notes on Teaching: Probably Spoken’. This entry was posted in Uncategorized and tagged academics, Australia Council for the Arts, Australian Postgraduate Award, Bill Manhire, book publishing, doctoral scholarships, ecomonics of writing, emerging writers, Grace Paley, Huia, Maori history, newspaper history, royalities, Scribe, Stop Press: the last days of newspapers, The Parihaka Album: Lest We Forget, writing. Bookmark the permalink.